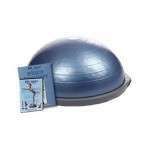 The Bosu Balance Trainer is a fitness training device which looks like a half of a stability ball – and there lies it`s advantage: You can position it in two different ways and get entirely different possibilities for your training. When the inflated rubber dome is on top, it offers you a combination of unstable ball on a stable board. And if you position the device upside down, you get a surface that is completely unstable. One of the biggest advantages is that BOSU ball can be used by anyone – men and women, children, adults or elders, beginners, elite athletes or even injured people during recovery. 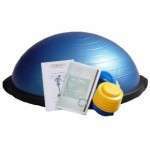 This Home version is not intended for commercial use (you will lose the warranty) – if you want to use it as a trainer for example, I would recommend you to buy the Proffesional version of BOSU ball. The advantages are increased durability, dually over-molded platform for extra strength and 1 year commercial warranty.